Lactose intolerance can make eating a balanced diet more complicated. If you’re one of the millions of people who have trouble digesting milk products, there are plenty of delicious ways to get the nutrients you need from both dairy and non-dairy foods. These tips will help you live a healthy life. Control serving sizes. Lactose intolerance is usually a matter of degree. Find your individual comfort level by cutting out all dairy foods and then adding them back into your diet a little at a time. By eating dairy products in moderation, you can probably avoid the typical symptoms like cramps, gas or bloating that usually occur within 2 hours of eating a trigger food. Combine dairy products with non-dairy foods. You may be able to tolerate trigger foods better if you pair them with other stuff. Try putting milk on your cereal instead of drinking a glass by itself. Serve ice cream on a slice of pie. Eat a lot of yogurt. 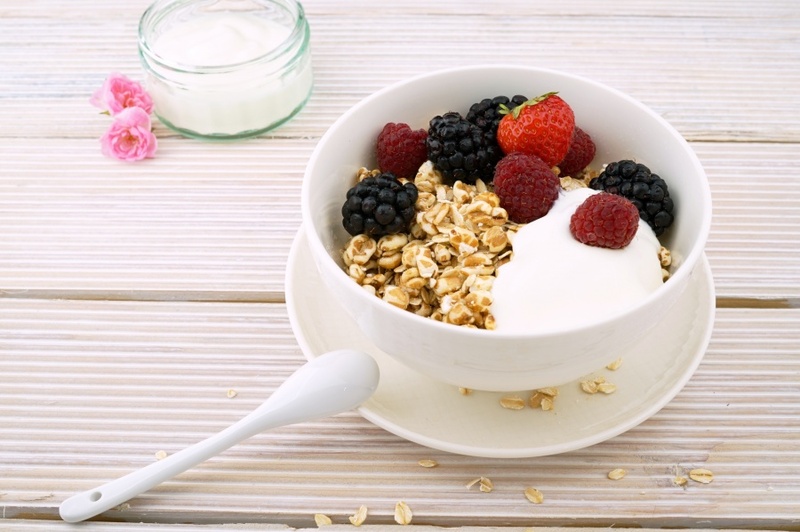 Even though yogurt contains the sugar (called lactose) that your body has trouble digesting, it also produces the lactase enzyme that solves that issue. Frozen yogurt lacks live cultures, but many yogurt products are loaded with active bacteria that will protect you from any discomfort. Say cheese. Cheese is another winner. Hard cheeses like cheddar are naturally lower in lactose than the soft and creamy styles like Brie. Cottage cheese and Feta are also good choices. With growing awareness about lactose intolerance, you also now have the option of lactose free cheeses. Look for special formulas. Virtually all dairy products, including milk, now come in lactose free and low lactose versions. With an estimated 30 to 50 million people in the U.S. alone being sensitive to dairy products, there’s a huge market for producers to cater to. Read package labels carefully. Watch out for milk products in places where you’re unlikely to suspect them. Many processed foods contain dairy products, as do certain organ meats and even lima beans. Read labels to see if what you’re buying contains whey, caseinates, milk solids, curds and other ingredients that could spell trouble. Consider supplements. You might find that lactase enzyme supplements enable you to keep eating dairy products. Ask your doctor if they’re right for you. Learn about non-dairy calcium sources. Calcium is essential for healthy bones, nerves and blood circulation. If you think you need more calcium, try non-dairy sources like broccoli and other green vegetables or fish with edible bones like salmon and sardines. Mind your vitamin D intake. Vitamin D is also important for your bones and general wellbeing. While milk is fortified with this essential nutrient, so are many other foods like bread and breakfast cereals. Natural sunlight also helps your body make its own vitamin D.
Order Chinese food. Eating out can sometimes pose difficulties when you’re trying to avoid lactose. Most Asian cuisines rarely use dairy products, so you should find plenty of dishes on the menu that are appealing and safe. Learn new recipes. At home, you can modify many recipes that use dairy products to suit your needs. For example, fruit pulp can stand in for butter. Be prepared for age-related changes. Many people become more sensitive to milk as they grow older. Knowing your options will help you to keep eating well. Lactose intolerance is usually easy to manage. Find your individual comfort level with dairy foods, opt for the safest choices like yogurt, and get calcium and vitamin D from non-dairy sources if needed. Your doctor or a nutritionist can help you design an eating plan that will keep you well nourished.